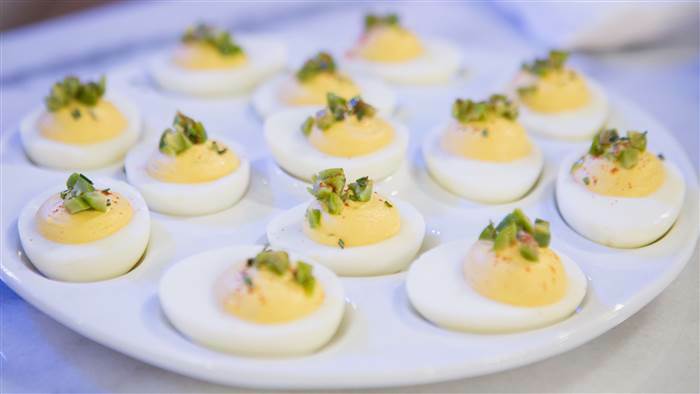 Upgrade classic deviled eggs with olives, which also give the dish a health boost: they’re loaded with vitamin E and you get a lot of good, healthy fats and great flavor. 1. Bring a large pot of water to a boil. Fill a large bowl with ice and water. 2. Add the eggs and cook for 8 minutes. Drain the eggs and transfer to the ice water. When cool, peel and cut each egg in half lengthwise. Transfer the yolks to the bowl of a food processor; refrigerate the whites. 3. Add the crème fraîche, mustard, cayenne, olive oil, lemon juice, rosemary, and a pinch of salt to the food processor. Process until smooth, scraping the bowl occasionally. The mixture should be soft enough to pipe through a piping bag, but not too loose. If it’s stiff, pulse in another tablespoon of crème fraîche. 4. Transfer the mixture to a piping bag or resealable plastic bag with a hole snipped in one corner. 5. Arrange the egg whites cut-side up in a single layer on a serving platter. Pipe the yolk mixture into the egg white cavities. 6. Top each with chopped Halkidiki olives. 7. Sprinkle with paprika and serve immediately, or refrigerate for up to 2 days. 2x160g salmon fillet; salt and coarsely ground black pepper, to taste; a dash of cayenne pepper; olive oil for drizzling; 2 cloves garlic, crushed; some shredded purple cabbage; 1 mini yellow capsicum, halved and sliced; fresh salad leaves like curly endives, etc. In a small mixing bowl, combine the balsamic vinegar, honey and salt. Stir to dissolve the salt before drizzling in the olive oil; whisk with a fork or small wire whisk until emulsified. Toss in the capers and green olives. Set aside. Preheat a grill pan over medium high heat. Sprinkle salmon with salt, black pepper and cayenne pepper. Drizzle with olive oil and cook for 2-3 minutes each side, or until cooked to your liking. Remove from grill. Add the garlic cloves and grill according to your taste. Remove garlic. Divide the cabbage, capsicum and salad leaves between two serving plates. 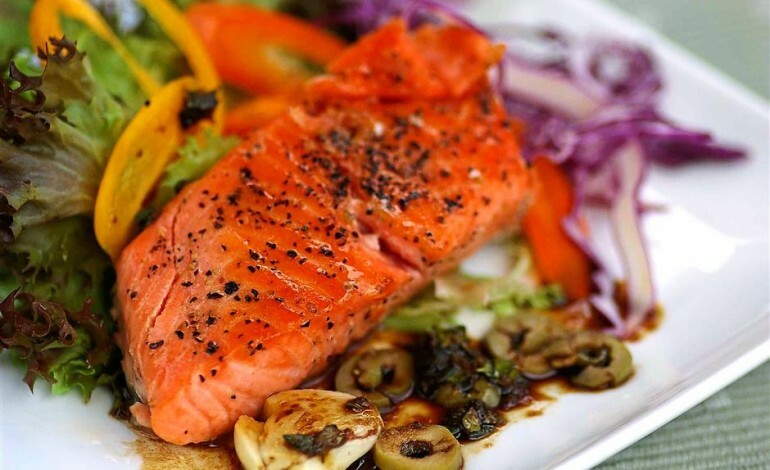 Place a slice of salmon and a garlic clove on each plate and drizzle the balsamic dressing over the salad. Serve.